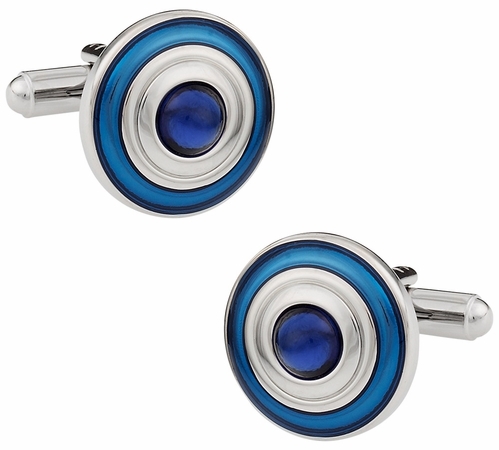 Elegant, stylish, and fashionable – three words that best describe this wonderful pair of cufflinks. The round, 5/8” diameter cufflink set has been given a core of dark blue enamel, surrounded by interwoven threads of polished silver; this combination offers these cufflinks a classy and delicate touch. Due to their neutral colours, they can suit you no matter what colour your shirt is or how you choose to combine your outfit, giving you a sense of elegance and charm. Their durability and superior craftsmanship is demonstrated by the awesome product warranty that comes along with each and every one of our products. I like how the blue really compliment the silver setting.